An afternoon of racing in Russia has been completed, culminating in a somewhat predictable podium, four drivers retiring from the race, one safety car, one engine issue, and just 26 pit stops throughout the 53 laps. After first lap chaos brought out the virtual and then the actual safety car, the bunched up field spread out once again to limit the number of battles occurring on track. With Sochi's easy tarmac being kind to the tyres, there were fewer pit stops than normal, although all were completed in top notch fashion. If you missed any of the action or want a recap of what went down in Russia, read on! Nico Rosberg takes an easy win from pole in Russia. Lewis Hamilton recovers from tenth place to second with Kimi Räikkönen also on the podium. Kvyat crashes into the back of Vettel TWICE on the first lap, spinning the German out of the race. Hülkenberg and Haryanto also retire in the first lap chaos. Max Verstappen suffers engine failure to drop out midway through. Double points finish for McLaren after one stop strategies dominate the field. Hello everyone, welcome to the Factbyte Factbox for the Russian Grand Prix. It's the third running of a race that hasn't thrilled in previous years - but 2016 has provided all kinds of upsets so far, today might see some more! It's cloudy above the Sochi circuit but the sun is out and it doesn't seem as if they'll be any rain, so running should continue unhindered. There's half an hour until the race gets underway, so the pit lane has just opened, cars are fired up and are heading out for practice starts and installation laps. It's the same three sets of tyres on offer today, but because Russia is so crazily kind to the rubber, drivers have leaned towards the softer compounds more - almost everyone brought just one set of the mediums for the entire weekend. Max Verstappen lined up for a practice start and his Toro Rosso engine didn't look or sound totally on form - some wisps of blue smoke came out the back! But he got it running and it seems to be fine for now. Talking of engine drama, Hamilton has suffered another energy recovery setback, with the defending champion unable to participate in final qualifying. That means he lines up tenth on the grid. Hamilton has, however, the dominant record around Sochi, winning both of the races in its relatively short history. With the threat from Hamilton neutralised in qualifying, Rosberg secured a solid pole position to set himself up for a great start to the day. Valtteri Bottas was third in qualifying, behind Sebastian Vettel. The Ferrari driver picked up a gearbox related five-place drop, however, which has promoted Bottas to the front row of the grid. It's worth noting, of course, that Bottas and Räikkönen now start the race next to each other and they have some history at this track. Last year, the pair collided after Kimi mistimed an overtake on the final lap whilst fighting for the final podium position. In the end, Bottas was in the barriers and Räikkönen dragged his car to fifth. The pair were asked about it on the driver's parade today, and seemed a bit frosty although Bottas was laughing, so perhaps no hard feelings less than a year later. Jenson Button: "Bit sad to not get through to Q3 yesterday, but starting twelfth, new tyres on the car, see what we can do. It’s going to be a tough one." "I'm sure something is not working like it should, hopefully by the next race we'll sort it." Romain Grosjean isn't happy with his Haas. We've heard this complaint from Marcus Ericsson at Sauber (who starts last today), and Jolyon Palmer who finally seems to have found some comfort in his Renault. Daniel Ricciardo on the grid: "The start of the season has definitely been what I wanted. I wanted to start strong with good intentions, I’m doing what I can. I think Williams are our target, that’s what we’ve got our sights set on today. If we can finish in front of both of them, that’ll be a good result for us." The Toro Rosso boys are starting one in front of the other, with Verstappen in 9th and Sainz in 11th. There's no love lost between those two - as each race goes by it feels like the tensions are growing more and more. Drivers have made their way to the front of the grid to listen the national anthem being belted out. Big cheers from the crowds as it comes to an end. Looks like a good number of visitors in the grandstands today. Tweet from @HaasF1Team: #RussianGP only 10 minutes away people! 53 laps around @SochiAutodrom - the third longest circuit in #F1. Only Spa and Silverstone longer. Jolyon Palmer: "Quite happy with the car, following on from yesterday. Going to try and move forward and see what we can do. It can’t be worse than China, I think we’ll have a good race." Mechanics make the final adjustments to the cars, and prep to whip off the tyre blankets ahead of the formation lap. Nico Rosberg leads the field away on the formation lap, with Valtteri Bottas close behind him. All drivers are starting on the red sidewalled supersoft tyres except for Nico Hülkenberg in 13th, Esteban Gutiérrez in 16th, and Marcus Ericsson bringing up the rear of the field. There's a 36 points gap between Rosberg and Hamilton in the championship standings - so it's still close enough to be a great fight, but it's also a big enough gap to be messing with Lewis's head. Clean start for Rosberg, he's well into the lead into the first corner. Bottas comes under pressure from Räikkönen immediately, and the Ferrari gets past for second place. There's a bunching up of the field, four wide, and Vettel spins round and off. He's into the barriers and out of the race. Nico Hülkenberg is also out of the race, his Force India sitting off track and the driver climbing out. The virtual safety car becomes a real safety car as the suped up Mercedes heads out on track. Pérez has a right rear puncture and is making his way slowly round on track. Kvyat has pitted for a new front wing. Ricciardo has also come in, with Daniel queued up behind Kvyat. As soon as he gets in, it's another nose change for the team. Great job by the Red Bull crew to get those two done. A new nose went on the Haas of Gutiérrez. A lot of spare parts in use today! There is carbon fibre all over the place, brave marshals are doing a fantastic job dashing out to clear the racing line. The Ferrari has been picked up by a tractor and is being removed from the track, whilst Vettel has been picked up by a scooter and is heading back to the pit lane. In the chaos, Hamilton made his way up to fifth place, so a good start for him. Vettel is actually driving the scooter, albeit without a helmet on. I guess he wanted to do some driving today! Replays show it was Kvyat who drove into the back of Vettel, which tipped the Ferrari off track. Vettel is bound to have some words to say about that, after last time! Behind them, a few cars bumped into each other as well, which is why there are so many new noses on display now. Radio from Sebastian Vettel is very swear-heavy, as he explains he got hit twice in the rear. Both were Kvyat. And they're off. Rosberg got away again well, and this time Bottas caught Räikkönen napping to regain his second place. Hamilton is up to fourth, with Massa losing out at the restart. 1st lap incidents at turn 2 under investigation. Looks like Rio Haryanto retired on that first lap as well, although we didn't see what happened to him. Rosberg's already gained a three second gap on the second place Williams, leaving the battle of the Finns far behind him. Hamilton is closing up to that fight, meanwhile, less than a second behind Räikkönen. Marcus Ericsson overtakes Dany Kvyat, with the Red Bull driver having taken on the medium tyres, and the Sauber on the softer compounds. Kvyat went all the way round the outside, off track as well, to try and take the place back, but he had to yield as that wouldn't count. Another couple of corners and he gets the position fairly. Räikkönen has closed up to Bottas' rear wing, hoping for some slipstreaming fun, but the Williams is great through the corners and gets away. Hamilton takes the advantage and pulls alongside the Ferrari, Kimi doesn't fight too hard and Lewis is soon up to third place. Tweet from @ForceIndiaF1: That was quick. Checo clears the second RBR in a row and is now in P16, chasing ERI. 10 second stop/go penalty for Daniil Kvyat - causing collisions in turn 2 and turn 3. Quick shots of Vettel back in the garage, watching the replay of the incidents. I wouldn't want to be Kvyat right now. Kvyat comes into the pits and draws to a halt for his ten second penalty. Drive through penalty for Esteban Gutiérrez - causing a collision. The early chaos has helped out a handful of drivers. Fernando Alonso and Romain Grosjean are up seven places each in 7th and 8th. Behind them the two Renaults of Magnussen and Palmer have risen eight places each to sit in the points for now. Hamilton is struggling to find an opportunity to take the fight to Bottas ahead, the Finn has found his best defending skills at the moment. Wehrlein put a good move in on the outside of Ericsson, the Sauber losing control a little and running off track as he drops to 15th. Sainz comes into the pit lane for a soft compound swap. That frees up Button and Pérez who are chasing after the final points position currently held by Jolyon Palmer. Felipe Nasr comes into the pit lane as his radio calls him in due to a puncture. Rosberg absolutely flying with an early fastest lap - 1:41.454. Sebastian Vettel: "I think you saw more than me, it was fairly clear. I got a big hit, lucky not to spin into turn two, then got another huge hit which turned me around, and couldn’t avoid hitting the barriers. I wasn’t worried to make contact with anyone, these things happen. It doesn’t help me, because I’m here and the race is still going. Something’s not right, but what can I do?" Jolyon Palmer has pitted for some soft compounds, that promotes Button into the final points position. Valtteri Bottas dives into the pit lane which avoids the Hamilton threat. Bottas comes in for some soft (yellow) tyres. It's a super stop by the Williams crew, and Bottas rejoins ahead of the Haas of Grosjean. Sebastian Vettel has headed to the Red Bull pit wall and has been chatting with Christian Horner. Telling tales! Lewis Hamilton has come into the pit lane for a fresh set of tyres. Another incredible stop, the pit crews are crushing it today. Hamilton emerges from the pit lane just as Bottas pulls alongside - they were side by side into the corner but Bottas has the momentum around the outside to get ahead. Hamilton has all the work to do again, he's so close behind Bottas now though, just a few tenths. Fernando Alonso is ahead of them in fourth. Hamilton puts it all in the hands of DRS and wings his car around the Williams to make it up to fifth place. Bottas wanted to fight back but ran wide at the corner to ease the pressure on the Mercedes. Alonso provides no barrier at all to the Mercedes as Hamilton gains another position and moves up to fourth. Räikkönen has come into the pit lane for his first stop of the afternoon, it's a bit of a clumsy getaway, but the Finn is on his way again hoping to rejoin ahead of Bottas. Hamilton easily sweeps past the end of the pit lane, but Räikkönen rejoins alongside Bottas and has the edge into the next few corners. Great strategy by Ferrari. Race leader Nico Rosberg heads into the pit lane and he rejoins in second place - with only Max Verstappen ahead, who has yet to stop. Verstappen pits, releasing Rosberg into the lead once again. He's now got a solid 12 second gap over second place Lewis Hamilton. In amongst the pit-stop reshuffles, Ricciardo has made his way up to tenth place. He's on a slightly different strategy to what was planned, I expect, having pitted for a new nose early on in the race. All drivers have stopped at least once now - and most probably plan to get to the end of the race on their current rubber now. Marcus Ericsson, however, is on the supersoft tyres, currently running in ninth place, and he's likely going to need something a bit sturdier before the end of the race. Ricciardo is on the medium tyre, so should easily get to the end of the race, but is on the slower of the three available compounds. Incident involving Carlos Sainz under investigation - forcing another driver off the track. Ten second time penalty for this. Team radio from Sergio Pérez: "Do you like my pace, do you like it?" "You're doing well, Checo, pace is good." Pascal Wehrlein attempted a move at Felipe Nasr, scrabbling for the lower end of the positions. After bumping across the kerbs, Wehrlein stayed behind as Nasr ran wide and rejoined on the wrong side of a bollard. Now, this is an important bollard, that Charlie Whiting has stipulated must be obeyed, and Nasr didn't so it's not a surprise when he picks up a penalty. 5 second time penalty for Felipe Nasr - not respecting race directors instructions regarding turn 2. Bit of action out on track with four drivers battling for eighth place. Kevin Magnussen is leading the charge, with Romain Grosjean behind him and Carlos Sainz sitting in tenth now. Ricciardo was in the fight but had to bail because his medium tyres had nothing left - into the pit lane he goes and it's soft compounds onto the Red Bull. Hamilton is closing the gap to Rosberg, with the leader now less than ten seconds ahead. Still a lot of work to do though. Ricciardo didn't make it to the end just one-stopping, but Daniil Kvyat is on the same strategy - he's had just one change of tyres and is now on the mediums. Can he get through the next twenty laps? Yellow flags as Max Verstappen slows right down and pulls off track. Team radio from Max Verstappen: "There's something with the engine." Which seemed likely after that practice start getaway oh so long ago. Team radio to Lewis Hamilton: "So Lewis, it looks like we have a water pressure issue." Things have definitely calmed down on track now. With no more pit stops expected, drivers are hunkering down and hoping for clean lap after clean lap to preserve their positions. Six drivers have been lapped, and we have four retirements at the moment. Another fastest lap for race leader Nico Rosberg, we're at 1:39.616 now. That's a Sochi record, apparently. Hamilton has either intentionally or been forced to back off from the fight to close the gap to Rosberg now. It's up to 12 seconds, as Rosberg breathes a sigh of relief no doubt. Pascal Wehrlein came into the pits for an extended stop there, as the team struggled to change the Manor onto the supersofts. Alonso is doing a good job to stay up in sixth place, hoping to secure some much needed points for McLaren. Team radio to Hamilton: "Lewis, the situation has stabilised." Jolyon Palmer doesn't quite have the pace to keep up with the scrap ahead of him - but everyone behind Carlos Sainz is looking to stay within ten seconds thanks to the time penalty awaiting the Spanish driver. Nice graph to show that Hamilton's lap times rose dramatically after the water pressure warning, and have started dropping again now that it's under control. What you can't see is the gap to Rosberg who has increased his lead to 14 seconds now. Ted news from the pit lane: Alonso turned up the power for a single lap, dropping his times by a whole second, because he "just wanted to have fun." Team radio to Fernando Alonso: "“That was good pace. Normal driving now. Gap to MAG 9.6.”"
Felipe Massa has dived into the pit lane from fifth place, he's bolted on the super soft tyre. The gap to Alonso was big enough to allow the Williams to rejoin in the same position. Tweet from @RenaultSportF1: Confirmed severe foot tapping occurring here too. Jenson Button has overtaken Carlos Sainz for the final points position - he would have gained the position at the end anyway, but it was a solid move. Both McLarens in the points now. Only six cars remain on the lead lap now. 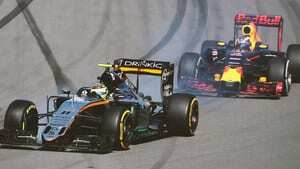 Replays show Daniel Ricciardo taking to the inside of Jolyon Palmer to move up to 12th place. Hamilton has eased off massively over the last couple of laps, losing two or three seconds to Rosberg - it's now up to 23 seconds. Nico Rosberg wins the Russian Grand Prix! Hamilton holds on to second place, with Kimi Räikkönen taking Ferrari's 700th F1 podium in third. Double points for McLaren, more points for Romain Grosjean, and Kevin Magnussen also gets some points for Renault. Solid midfield results today. Those five drivers are the only ones who finished on the lead lap. Everyone from Fernando Alonso down had been lapped at least once. As Rosberg gets out of the car and heads over to hug his mechanics, they grab him and lift him up for an impromptu spot of crowdsurfing. He extricates himself to get back to the weigh-room though. Podium green room action pretty dull this time out. Bernie and Putin are there making small talk, but the drivers escape to take to the podium. The German national anthem plays out, as Rosberg stands appreciatively atop the podium. Hamilton doesn't look too impressed, but it's got to be said the luck is not with him at all at the moment. The trophies are handed out, and then it's time for a spot of champagne! Hamilton doesn't go with the champagne celebrations, shying away from the spray from the Mercedes representative too. Podium interviews - Nico Rosberg: "It’s been an awesome weekend, the car has been fantastic in qualifying and the race today. It felt special out there, I’m very happy. Thanks to everyone, thanks to all the fans out there... it’s been a great weekend. "I just like to keep up the pace for concentration, if I slow down I start making mistakes, just enjoy it out there, flat out until the end. Great job from Lewis to come up to second so quickly from down in tenth. I was always aware of what he was doing and trying to keep the gap as much as possible. "It’s four races from 21, Lewis is going to come back of course, he’s on it and as motivated as ever. Early days, just taking it race by race. Looking forward to Spain now, we have such an incredible car that is such a pleasure to drive, just want to win races." Podium interviews - Lewis Hamilton: "It was not the easiest first corner but all races have been the same so far. Really happy for the team, you know, I got the points. With Kimi, I don’t know if he was expecting me to overtake there which was great. The second one, with Valtteri, I was quite far back but he didn’t seem to defend so it was quite easy. There wasn’t a doubt in my mind I could win it, I had the pace, but then I had a problem with the engines again so I had to back off. I wasn’t full throttle down the straights, just trying to look after it." Podium interviews - Kimi Räikkönen: "It’s not exactly what we want, we want to win races and put two cars as far up as we can. We tried today, I had a pretty okay start, managed to get past Valtteri on the fast lap. On the restart, same like last year, we just don’t have the speed and he managed to get me. When I tried to get past him, Lewis get past me. We tried to run a bit longer and get past them, managed to do the Williams but not fast enough for Mercedes. Then we had good speed, but with the fuel saving we had to take some measures, you cannot push as fast as the car will go." So, that was a couple of painful hours really. From the green light to the safety car, it was a cracking race - all one lap of it. Otherwise, it wasn't the most exciting battle we've ever seen. Rosberg had an easy afternoon, Hamilton did a great job but still isn't satisfied with his performance. The midfield, as already discussed, saw some good points hauls, but it's a shame Vettel had to miss out on the fun thanks to Kvyat (again). The next race is in Barcelona, which will be both Alonso and Sainz's home race, and should hopefully be slightly more interesting than what we've witnessed today. The take home message is that it's still early days, but things continue to go Rosberg's way. Until next time, fact fans.